I know it's bloke's fiction but it still had me chuckling. 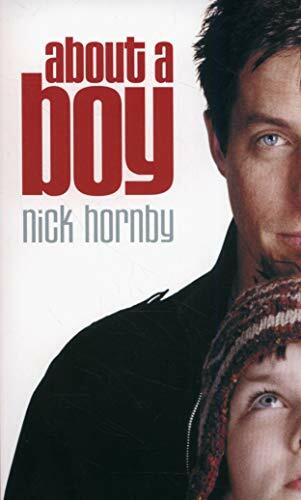 I've not seen the film but I'm sure Hugh Grant made an excellent Will - selfish, childish, needy, egocentric... Will's relationship with Marcus leads him on a journey of painful self-discovery amidst some very funny moments. Thanks for the book ! Arrived in Qantaqa's English Bookbox. Since I already have a copy of my own (and I love it! ), I'm offering this as #7 in this BookXerpting. The book has already found a new reader and is on its way to CaptainCarrot! Thank you for the book - I haven't read it and didn't see the movie. I hope I can read it soon! I'm sorry to say, but I did not read the book to the end. Too much other things to read and do... But now I've found a new home for Marcus and Will. Reist zu chawoso - viel Spaß! The boy in company with a widow and a silly dog (suprise) arrived two days ago. Thanks a lot for that RBACKs, CaptainCarrot! I read the story about Marcus and Will some month ago and I realy like it. On its way to pam99 (Scotland! ), who had chosen this book at the "First Sentence VBB". I'm in Scotland rather than the USA, but thank you very much for the book! I think I might have read this a good few years ago - I've definitely seen the film - but I'm going to read it again. I'd read this before (back in 2007) and re-reading it, again thought the book was much better than the film - had me laughing out loud in places. I will get to this one shortly and then will pass it on to valpete. Sending this on to Valpete in CA (USA) to continue the ray! I had completely forgotten that I had signed up for this one...must have been in a weak moment. I have a few before this one, so will get to it ASAP. I do promise to read it and send it on to the next reader. My apologies for keeping this so long. I'm sending it along to the next person on the list. A humorous coming of age book about Marcus, an eccentric, introverted, bullied 12-year old and his new friend, Will, a 36-year old bachelor, who is cynical and immature. Nick Hornby explores characters who are sad, funny, and flawed in a world filled with the complications and triumphs of everyday life. I look forward to reading more from this author. I got this book yesterday. Thank you valpete! The book is with me. I've already started reading . Thank you chocola905 for sending it along with the nice bookmark and the christmas card ! I read it in two days but due to the christmas preparations and the crowded post offices, time passed and the book is still here. The next reader was not in a hurry though. I have the address and I am planning to post it next week. I certainly enjoyed it, I am a Hornby's fun, I like his books, I liked this one too. I am glad I joined the ring! Forgot all about joining this book ray. I have seen the film but I usually enjoy the books more. Looking forward to giving another Nick Hornby book a go.